At last! 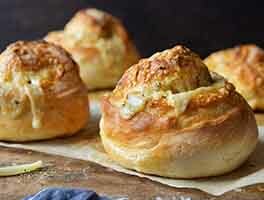 The quintessential soft, buttery dinner roll. Nestled — we might even say "crowded" — into a couple of 8" round pans, the shaped buns rise into one another as they bake. The result? Soft-sided pull-apart buns, ready for melting pats of soft butter. 2 hrs 37 mins. to 3 hrs 44 mins. Place the dough in a lightly greased container — an 8-cup measure works well here. Cover the container, and allow the dough to rise for 60 to 90 minutes, until it's just about doubled in bulk. Cover the pans, and allow the buns to rise till they're crowded against one another and quite puffy, about 60 to 90 minutes. Towards the end of the rising time, preheat the oven to 350°F. Uncover the buns, and bake them for 22 to 24 minutes, until they're golden brown on top and the edges of the center bun spring back lightly when you touch it. An instant-read thermometer inserted into the middle of the center bun should register at least 190°F. Remove the buns from the oven, and brush with the melted butter. After a couple of minutes, turn them out of the pan onto a cooling rack. Serve warm. Store leftovers well-wrapped, at room temperature. Rather than worrying about heating milk and water to lukewarm, simply combine cold milk with hot tap water. The result? Lukewarm liquid, which is your goal. To make the buns the day before, then bake them just before serving, prepare them up to the point where they're shaped and in the pan. Let them rise until they've filled the pan and are touching one another, but aren't fully risen. Cover with lightly greased plastic wrap, and refrigerate. Next day, remove the buns from the fridge (keeping them covered), and let warm/rise for an hour or so before uncovering and baking as directed. For smaller buns, divide the dough into 24 pieces instead of 16. Bake in a 9" x 13" pan (four rows of six buns each), if desired. Want to make these buns a day or so ahead of time? 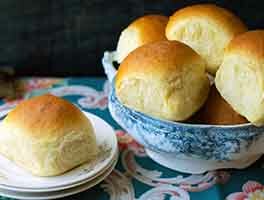 Try the tangzhong technique, a Japanese method for increasing the softness and shelf life of yeast rolls. Begin by measuring out the flour and milk you’ll be using in the recipe. Now take 3 tablespoons of the measured flour and the 1/2 cup milk; put them in a saucepan set over medium-high heat. Cook the mixture, whisking constantly, until it forms a thick slurry; this will take about 1 1/2 to 2 1/2 minutes. Transfer the cooked mixture to a bowl, let it cool to lukewarm, then combine it with the remaining flour and the other dough ingredients, increasing the amount of water to 7/8 cup (7 ounces). Proceed with the recipe as directed. 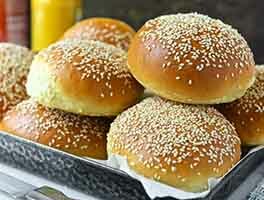 Well-wrapped and stored at room temperature, your finished buns should stay soft and fresh for several days. Okay, I've made these in the past and thought they were okay. This time I had some bread flour that I wanted to finish off, so I thought why not. OMG these are so much better with bread flour. Still pillowy and tender, but a much better texture. 13/10 would totally bake it again. In a word .. "Winner!" 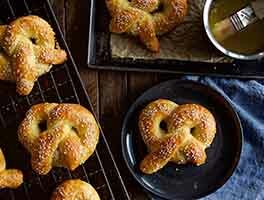 Easy recipe and great, soft dough. Christmas Eve crowd loved them so I repeated for the Christmas night crowd. Living in the desert I struggle with dough as I always feel like my dough's are too dry. I love that KAF recipes are available in gram measures as I feel this really improves the accuracy. Since I still consider myself a beginning baker, can this dough be used to make Cinnamon Rolls? These are pretty delicious. Nice and buttery, with a good texture, and they look gorgeous, so that's a plus. I do have a question though. 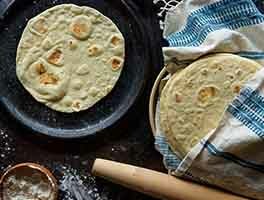 What texture is the dough supposed to be? I'm use to baking with bread flour, and usually have a slightly sticky or tacky dough. This dough was quite firm and not sticky at all. I got nervous and did add a few teaspoons of water to the dough, until it was a bit more smooth and almost sticky, but I didn't want to loosen the dough too much even though I was tempted to keep adding water. Also, I'm assuming its because of the lower protein content of the all purpose flour, but the dough wasn't as elastic and ripped apart more easily than I'm use to. Maybe that lends itself well to rolls, as my end result was delicious and I liked the texture. I don't know if I did something wrong or if that's how it's supposed to be... btw I used sprinkle and level method to measure my flour, which almost always works, but maybe I should weight next time? THANKS for GIVING us this recipe. Can't eat just one. Only problem I had was that I made these rolls kind of big. Glad I did. Only made 13 rolls instead of 16. It turned out it wasn't really a problem. Didn't have any left overs. I made these rolls for Thansgiving Dinner and they were the star of the party. Everyone who has eaten one loved it and they are easy to make. I guess the potato flour and special dry milk, along with the melted butter on top really work their magic. I have made other rolls before and they were always a bit stiff, not these. They are really soft, do pull apart easily and the melted butter puts them over the top. I mixed a full recipe and nestled 8 100 gram rolls in a 9 inch round pan. The rolls were bigger but delicious none- the- less. 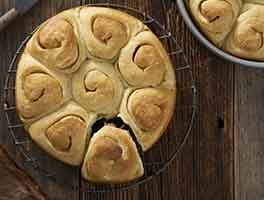 I was pleased with the recipe as originally published and the buns got great response. I am really pleased with the Tangzhong variation. Buns and sandwich rolls were light and tasty. One question, when the Tangzhong starter, cooked milk and flour, is finished could you cool it quickly by adding cold, instead of the lukewarm, water called for in the recipe, to get all liquids in the recipe to lukewarm more quickly? The first time I made these to bring to family dinner, my mom ate one and said, "Well, I'm not making rolls anymore. You are better at it." I have yet to take them somewhere where I don't get people raving about them afterwards. I just made them again and was concerned because the dough was a bit stiffer than usual but they still came out beautiful. I have made these rolls for the past few years at Thanksgiving. These rolls are such a big hit I have to make extra rolls for everyone to take home. I was wondering ways to make these a little sweeter. Any suggestions would be appreciated. Can I substitute gluten free flour all purpose blend that you guys make?